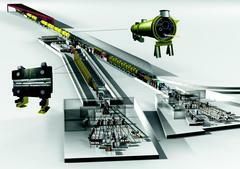 DESY opens new vistas into the nanocosm at its pioneering X-ray laser FLASH. A comprehensive technological upgrade and expansion of the facility enables entirely new experimental opportunities and opens up groundbreaking technologies to the international scientific community. 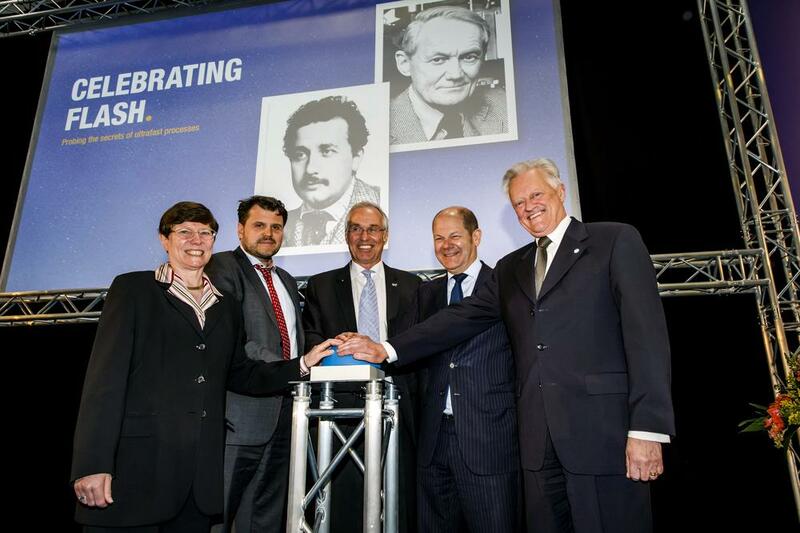 At a symbolic ceremony, Olaf Scholz, First Mayor of Hamburg, and Anders Lönn, State Secretary to Sweden’s Minister for Higher Education and Research, named the two FLASH experimental halls after the pioneer physicists and Nobel Prize winners Albert Einstein and Kai Siegbahn. “The further technical refinement of our successful X-ray laser FLASH will now give researchers from all over the world even more precise insights into the nanocosm,” said the Chairman of DESY’s Board of Directors, Helmut Dosch. In future, scientists will be able to peer into the nanocosm using FLASH at up to twelve different experimental stations, to make film recordings of chemical reactions, for instance, or to examine the dynamics of new types of data storage device, or to observe biomolecules at work. 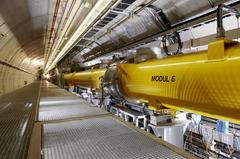 The research capacity of the X-ray laser is thereby being doubled. 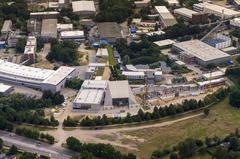 “The double FLASH is a further element by which the DESY Campus in Bahrenfeld is being expanded, turning it into one of the world’s leading sites for studying the structure of materials,” emphasised Scholz. 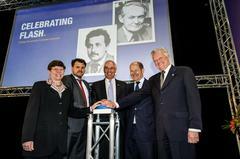 “We are greatly honoured that you chose to name one of the laboratory halls after the Swedish scientist Kai Siegbahn,” said Lönn. The Swedish-German cooperation in the framework of the Röntgen Ångström Cluster is not only bringing together world-class research in Germany and Sweden, Lönn emphasised. The comprehensive research infrastructures in the region are also very competitive in attracting high-tech industries. FLASH delivers extremely short and intense X-rays flashes, which can be used to observe the ultra-fast processes taking place in the world of molecules and atoms. The facility is used by some 200 scientists from all over the world annually, but this is only a small fraction of the research proposals submitted. In the past three years, DESY has extended the facility for a cost of 33 million euros, adding a second laser line and a second experimental hall. In doing this, however, DESY is not just increasing the number of experimental stations available; the quality of the X-ray flashes has also been improved thanks to new technological developments, and the facility is more flexible too. In contrast to the original laser line, the wavelength of the X-rays on the new laser line can be altered during operation. 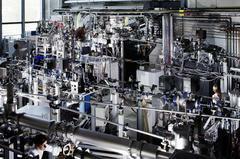 The Free-Electron Laser in Hamburg (FLASH) uses a particle accelerator to produce ultrashort pulses of narrowly collimated X-ray beams. An accelerator boosts the speed of freely moving electrons until they are travelling at close to the speed of light. These high-speed elementary particles then enter a magnetic slalom course, known as an undulator. Every time the electrons are forced to change their direction, they emit high-energy flashes of X-rays. These flashes are superimposed on each other and add up to form a laser-like pulse in an energy range known as soft X-rays, just beyond the ultraviolet range. FLASH has pioneered this field: In 2005, it became the world’s first free-electron laser in the X-ray range. Since then, other machines of this type are under construction or already in operation around the world. 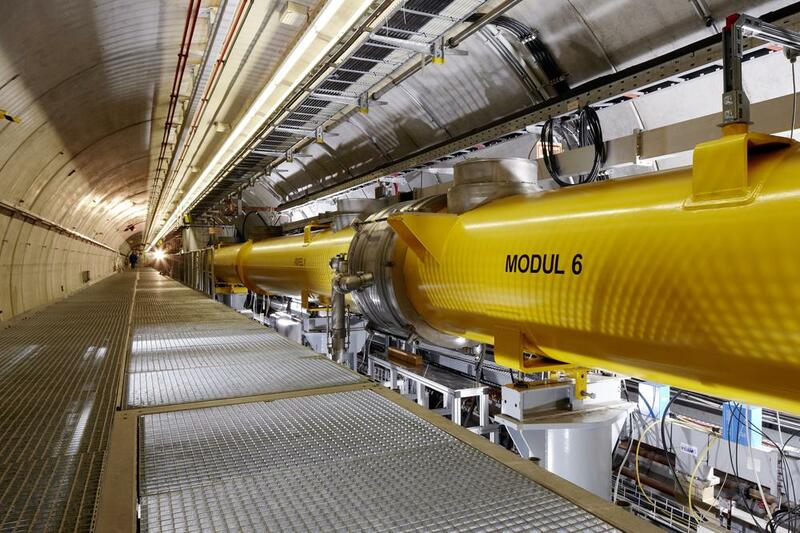 One of them is the European X-ray Free-Electron Laser, European XFEL, which uses the technology developed at FLASH and is currently being built underground from DESY’s Hamburg site to the neighbouring district of Schenefeld in Schleswig-Holstein. It will go into operation in 2017. The FLASH extension that has now been launched breaks new ground too: it is the first free-electron laser in the world to work with two laser lines. Apart from FLASH, DESY also operates the X-ray source PETRA III, which is driven by a storage ring. PETRA III is the most brilliant X-ray source of its kind in the world.